I’d just like to say, aside from any discussion of Masters 25 in a gameplay sense, I absolutely love the idea of watermarks that indicate which set the card originally came from. One of Magic’s greatest assets is its long history and its pedigree, and Wizards should take advantage of that more often. I don’t think people will be intimidated by the length of that history, if you present it right – you have the chance to become part of something that set the bar and is ongoing now! Hell’s Caretaker has an undeniably powerful effect, despite its relatively high cost. Four mana on a creature which you can’t use the same turn without the use of other cards is a little high for the more cutthroat settings, but if you can keep the Caretaker in play for any length of time, any opponent will have a very hard time keeping up. You can even turn the additional cost of sacrificing a creature into an advantage by using things like Brindle Boar or Reef Worm, rather than the obvious random Saproling or such. The fun thing about the Masters line is I get to see cards that were lost to time and I was unaware of their existence. Hell’s Caretaker is one such card. Golgari is my favorite guild to play, so sign me right up. Being able to sacrifice a creature to revive another may sound like parity, but in the right deck there is no down side. 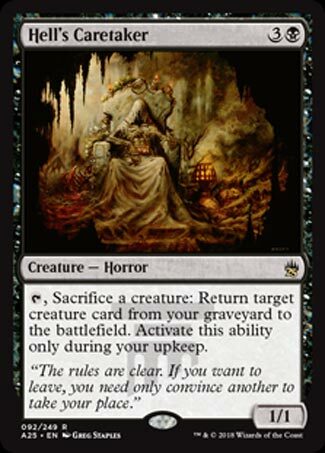 Sacrifice a Viridian Emissary to grab a creature you milled with Grisly Salvage. With a Grave Pact out, sacrifice an Abyssal Gatekeeper to revive a Fleshbag Marauder. This guy supports so many strategies. Hell’s Caretaker’s greatest flaw is his speed. Fortunately Dark ritual also just got reprinted. Only having 1 toughness means he is easy to deal with. The 1 power is a bit moot since after the first turn Hell’s Caretaker will probably perpetually tapped. I can’t imagine a Meren EDH deck not running a copy of this guy.